Acronym for National Security Agency. The NSA is an agency of the American government that protects U.S. information systems and produces foreign intelligence information. It was created on November 4, 1952 by President Harry S. Truman. A high technology organization, the NSA is on the frontiers of communications and data processing. The Agency's early interest in cryptanalytic research led to the first large-scale computer. The NSA also pioneered magnetic tape storage and made ground-breaking developments in semiconductor technology. Its mathematicians contribute directly to designing cipher systems and searching for weaknesses in competing systems and codes. The National Cryptologic School provides training for the NSA and is a resource for the entire Department of Defense. 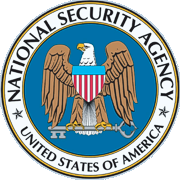 The NSA is also one of the most important centers of foreign language analysis and research within the U.S. Government. The NSA sponsors employees for bachelor and graduate studies at the Nation's top universities and colleges. Selected Agency employees attend the various war colleges of the U.S. Armed Forces. Most NSA/CSS employees, both civilian and military, are headquartered at Fort Meade, Maryland, centrally located between Baltimore and Washington, DC. The NSA releases four major types of documents to the public. These releases consist of press releases, public speeches and briefings given by our senior leaders, Freedom of Information Act ( FOIA ) releases, and declassified documents. As part of NSA's compliance with the Electronic FOIA ( E-FOIA ) requirements, the NSA has started positng FOIA information informing the public of the NSA's missions and functions. Project OPENDOOR, provided an index of 4,923 entries containing approximately 1.3 million pages of previously classified documents from the pre-World War I period through the end of World War II, which have recently been released to the National Archives and Records Administration ( NARA ). Many ufologists believe that the NSA knows much more about UFOs than it discloses to the general public. Citizens Against UFO Secrecy ( CAUS ) have been seeking the release of classified UFO documents under the Freedom of Information Act, but have not been able to obtain many of the requested documents.